Are you currently striving to reach the next level of success in your law practice but feeling like you simply lack the systems and strategies you need to do so? 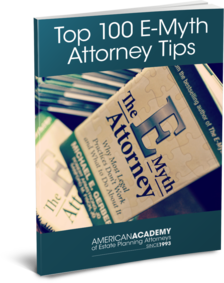 If so, we encourage you to take advantage of this FREE copy of "The Top 100 E-Myth Attorney Tips." Based on our book co-written with Michael Gerber, The E-Myth Attorney, this Top 100 list is a must read for any entrepreneurial minded attorney not satisfied with their current level of income, success or practice growth. Copyright © 2017 AAEPA. All rights reserved. Get your free copy today by clicking the link above! Complete Your Information Below To Receive Your Free Copy!